Welcome to Feathered Nest Friday No. 7! The weather here has been incredibly beautiful the past couple of days- near 80 degrees! LOVE IT!! and also got me thinking about some of my plants. I have three ornamental cabbages or kale that have been decorating one of my window boxes for the fall. I brought those in and placed them in little Italian clay pots. just outside one of the french doors. Added in some silver on the wall next to the menu chalkboard. I am loving the soft sagey colors that mingle together. ThenI decided maybe I needed some color in there. I love the red color- it adds a nice warmth to the sideboard. shabby faded paint on the antique dresser. I am searching for something to display there until I find all those beauties! it could be completely different all together in another day!! On to Feathered Nest Friday!!! to all of you who joined in last week! Such fantastic talent and ideas out there! I so enjoy visiting your blogs and seeing what you have been up to! shared this absolutely darling white feather tree that she made!!! I just love topiaries and this one is beautiful! I really love the one with the sage in the urn!! made from a burlap look fabric and TONS of bits of fabric. Wow! Thank you so much to all the party-goers for sharing your fantastic inspirations!! Can't wait to see what you bring this week!! Time for you to share your decorating projects, inspirations, flea finds, remodels, etc. etc. etc.!! Anything related to feathering your nest that you would like! Can be a NEW post or an OLD post - doesn't matter- just what you would like to share this week. Linky opens Thursday around 5:00 pm and is open until Sunday around 5:00 pm. ~I would just love it if you would become a French Country Cottage Friend/follower if you aren't already!!! ~Remember to link up your post that you are sharing- not your blogs main page. Just click on the title of your post and then copy that page link to share- and make sure your post is already published when you link up. ~ Please, make sure to link back to my blog - add a link to your post or grab one of my buttons- that way the other the participants can get some love and meet new friends too!! Remember, it's a party!! Have fun! Oh your lavender is heavenly!! I am so jealous it grows so well for you. It doesn't grow that well here. Your arrangement is just lovely. Thanks for hosting. Hi, Courtney! THANK YOU, THANK YOU! for featuring my pillow! My first choice was the vintage pictures but then I went back and took another look and I think I like the silver trays best! Love this vignette! Especially the chalkboard. Hi Courtney, Gorgeous vignette!! I love the decorated cabinet and the crusty urns. Everything is perfect! Thanks for hosting. I like the display with the old silver trays best. The lavender is gorgeous! 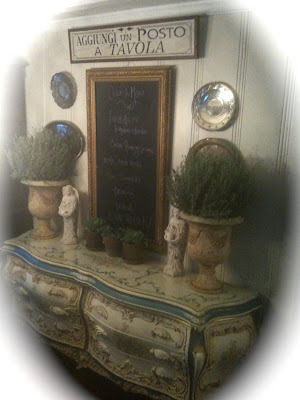 The entire vignette has a real vintage Tuscan look... ahhh! Courtney, I love the vignette you created. Gorgeous! Gorgeous vignette!! I love how all the outdoor elements look inside! The lavender is stunning in those fabulous urns and the silver is the crowning touch. Beautiful, Courtney! Hi Courtney! 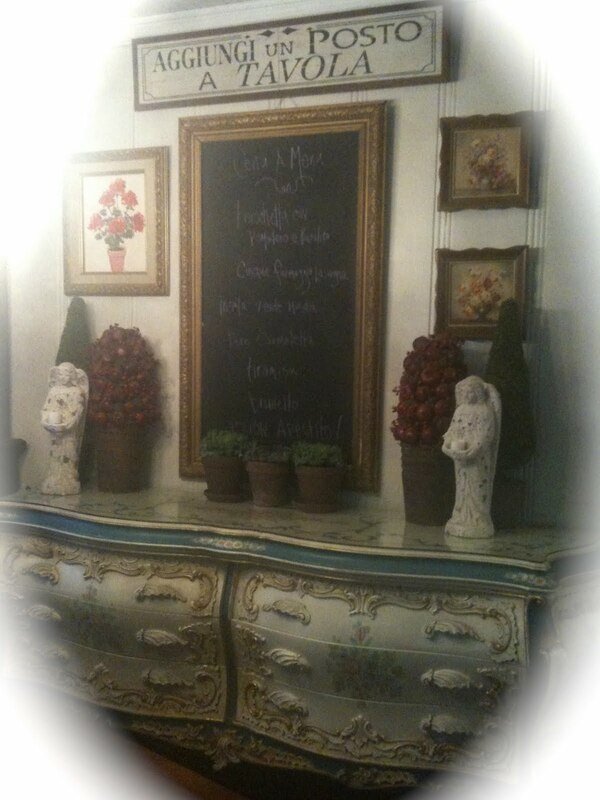 I love looking at your pots and urns on that fabulous sideboard! 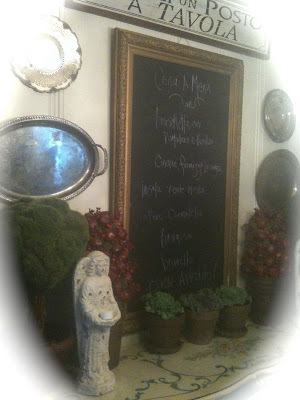 The signs and blackboard just bring it all together for the Euro look I love. My favorite arrangement is the one with the silver, and without the extra topiaries. I love joining your party Jacqueline! Thanks so much for having me today. I am so happy to be joining in for the first time. I have been "stalking" your blog for a while so am now a happy new follower too! You've got such a talent for arranging things beautifully. I love what you've done here. IT looks lovely. Great vignette. I like the kales in the pots. They have such great color. The whole vignette looks lovely though! Your whole decorative design is fabulous and that sideboard is to die for! Everything looks wonderful. P.S. ~ Please excuse my typo above (cuple should read couple)! Yikes! I have tried since yesterday to leave you a comment and blogger has not been cooperating! I rushed my 7th comment attempt and yeah, it went but I didn't check my spelling! Courtney, came over to say Hi and what do you know, you're having a party - so had to link up and get in on the fun. 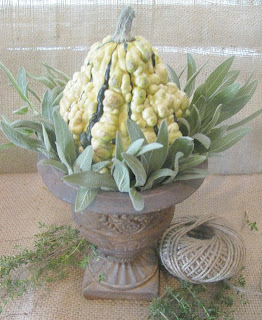 :=) Love what you've done with your cabbages and rosemary. It is gorgeous! I love the very first one and then you keep adding and they keep getting better and better! Thanks for the ideas! Wow, where have you been? I just discovered you from Confessions of a Plate Addict! You have such a lovely blog, and I'm your newest follower. I think I might join your party too. I love the lavendar, the cabbages and the topiaries. I have not seen pomegranate topiaries before...the red is a great addition. This just looks gorgeous now. It is perfection! Love every vignette you've put together! The lavender one is my favorite tho. Thank you for hosting Courtney! You are so sweet and your party is wonderful. This is the first time for me joining your party. I love your decor, and don't prefer one way or another, I love it all:) Thanks for having me! 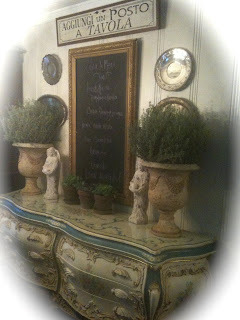 Love the potted herbs on the sideboard; beautiful! Does lavender overwinter for you indoors? I managed to overwinter rosemary last year, but then it died when I returned it outside in May! So pretty .. thanks for sharing, and hosting. Hi Courtney, I love the one with the paintings. :0) actually I love them all! oh and thanks for hosting! Oh, my.... what a gorgeous vignette. Your chest is to DIE for, too! Glad to have found your blog. By the way, thanks for visiting mine and thanks for hosting the party. Thanks for stopping by for a visit today! I like you entry for the Feathered Nest Friday! Have a great weekend! Love those pomegranate topiaries and your weathered angels. It all looks very beautiful! Just found your blog today and have linked to your party. Thanks for hosting. Thank you for stopping by my place enjoying recycled holiday gifting. NOW...I have to tell you I love the vintage trays and pottery plate look with the cement topiary urn look! I was instantly drawn to that look, not other chioce compares or measures up to the design wall. It shows history, authentic and speaks volumes. It will wow your guest and holiday entertaining, unique with all attention to your focal space. I can't wait to see what you decide on or changes you may make to it. 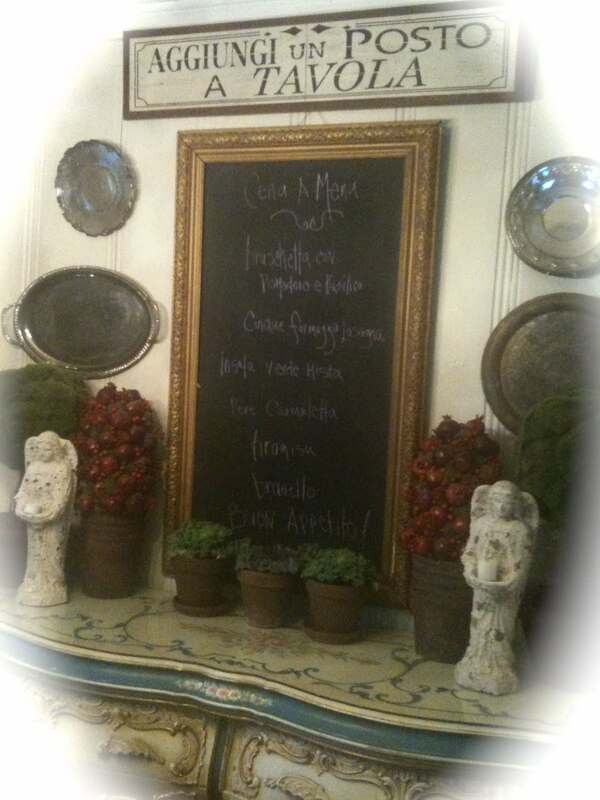 What a beautiful vignette, Courtney... so very European! I love that sign above your chalkboard, but it's all so fabulous! Oh...just read your comment that your Dad had a vintage stove he wants you to come look at. I was just thinking...if my Dad were alive...he'd probably say..."Lets go look at that stove". I know there are a lot of places that refurbish those old stoves and make them work as good as new or better...I don't know that there is any place around here that does it. And I certainly don't know about converting to propane. I'd make a few calls around town to see if it's possible and then decide if you need the stove. I can tell you...I'm almost tempted to get it...rip out my exiting built in, put the stove in place whether it works or not. I use like one burner on my existing stove and use the oven about twice a year. So really...I could survive with a big beautiful non working stove and just cook in the microwave if I absolutely had to. But that is just too crazy....so I'm just going to try to not think about that stove any more. Oh...I'm disappointed that I missed last weeks party somehow....hope to hit the next one.